High Park was Flicka’s destination today. See http://en.wikipedia.org/wiki/High_Park. My partner and some good friends of mine joined us. We discovered that High Park has some great off-leash dog trails. Unfortunately for Flicka, one of my friends was her handler for the park because I needed a break after yesterday’s adventure to the Mount Pleasant Cemetery, and my friend did not want to let Flicka go off-leash. My friend did go running with Flicka while on-leash, and Flicka seemed to enjoy the run. It was great to see my friend bond with Flicka. Flicka seems to like her and she seemed to like Flicka. This is great news because this friend is one of my back-up support persons for Flicka. Should, for some reason, I be unable to care for Flicka for a period of time, I have a group of support persons who have graciously offered to take care of Flicka for me. I am most grateful for their support, and knowing that they’re a phone call away gives me much peace of mind. Today, my partner and I took Flicka for a walk in the Mount Pleasant Cemetery (http://www.mountpleasantgroup.com/deathoccurred/cemeteries/locations/mp). Today was my public access test. I’d be lying to you if I told you that I wasn’t nervous. I was nervous! I find no pleasure in failing tests, and didn’t want to be embarrassed by failing this test. In the morning, I went to National Service Dogs (NSD)’s head office located in Cambridge, ON to meet with some of the staff there. NSD’s staff are wonderful. They were very warm and welcoming towards Flicka and I. Thank you! I got to meet Flicka’s sister. She’s been taken out of the service dog training program and she’s now breeding to keep Flicka’s family’s blood line going. I saw an interesting interaction between Flicka and a young puppy. The puppy kept badgering Flicka. When Flicka had had enough, she gently chomped down on the back of the puppy’s neck with her mouth. The puppy instantly hit the deck, lying flat on its stomach with all four legs stretched out. In a matter of seconds, the puppy submitted to Flicka. I had never seen this before. It was an insightful display for me. My public access test (PAT) with Flicka was conducted at Fairview Mall in Kitchener, ON this afternoon. Since National Service Dogs is an accredited member of Assistance Dogs International (ADI), my public access test was administered in accordance with ADI’s requirements. ADI’s requirements are available at http://www.assistancedogsinternational.org/standards/public-access-test/. For about an hour, Flicka and I had to perform a number of tasks to the satisfaction of the representative from National Service Dogs who was administering the test. Yes, I’m excited. Flicka and I passed our public access test, and we’re now a certified service dog team! Yippeeeeee! For the most part, Flicka and I did really well in performing our tasks. The last task of the test had to be, by far, the hardest task for Flicka. For two minutes, using only voice command and a one-time only physical leash correction, I had to stop Flicka from eating a hot and juicy hamburger patty that we bought in the food court. The test administrator broke off pieces of the patty and offered them to Flicka. The patty was dangled underneath Flicka’s nose, and, for a painfully long two minutes, Flicka was tormented with this patty. To her credit and the credit of National Service Dogs’ trainers, Flicka did not take the bait. She came close a few times but she held off. After the two minutes were up, Flicka got a yummy treat from me along with lots of positive praise! I’m so proud of her. Unfortunately, we have to do this task again, this time next year, when we’re up from our annual re-certification. Sorry, Flicka, we’re going to have to practice this task from time to time over the next year. 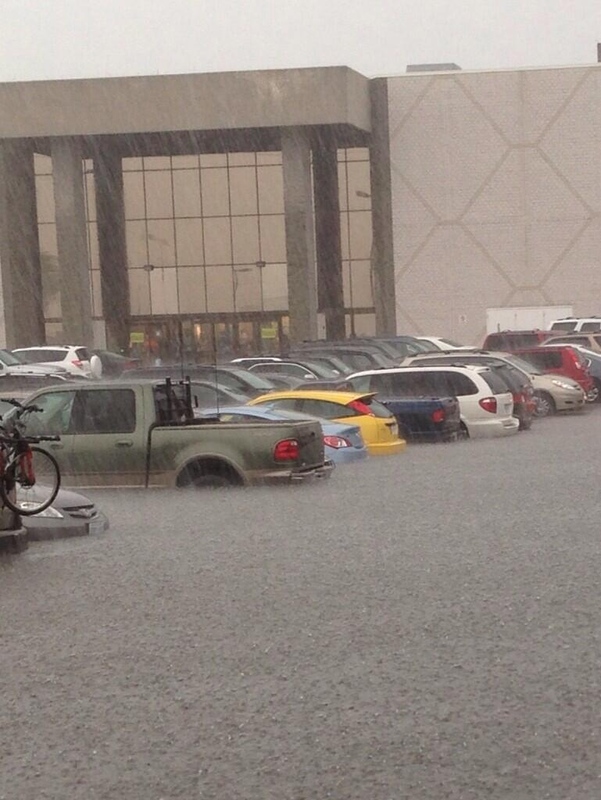 When I exited the mall, torrential rain was teeming down. It was not raining when I entered the mall. Now, the majority of the parking lot was flooded. I’m very fortunate that I parked my vehicle in an area of the parking lot that was unaffected. Some photos of the parking lot are below. This flooding was also covered by the media. Some of the stories are located at: (i) http://globalnews.ca/news/680423/heavy-rains-cause-flooding-near-kitchener-mall/; (ii) http://kitchener.ctvnews.ca/torrential-rain-causes-traffic-tie-ups-localized-flooding-1.1346070. Today was a very busy day for Flicka and I. We took the subway together for the first time. We had no issues, and, as soon as we entered the subway car and I sat down, Flicka put herself underneath my seat and stayed there until we got off the subway. What a great girl! We visited a small office place. The people at that office were very good to Flicka, and our visit gave me an opportunity to see how Flicka handles an office environment. I liked what I saw from Flicka. Afterwards, we went to the main floor of a big office building so Flicka could meet some of my work colleagues. The introduction went well, and it was hard to say no to my colleagues when they wanted to pet Flicka. Yesterday, I found out that Flicka is not to go on escalators. For safety reasons, National Service Dogs does not permit their dogs to travel on escalators. Given that Flicka has a lot of fur, I can appreciate that it could be a very dangerous situation if her fur were to get caught on an escalator as she’s exiting it. My office building has double-decker elevators. If you want to go to an odd-numbered floor, you have to enter the elevator on the concourse level. If you want to go to an even-numbered floor, you have to enter the elevator on the ground floor level. When you’re travelling down an elevator from one of the upper floors, the elevator you’re traveling in will drop you off either at the concourse level or at the ground floor level – the only problem is you can’t predict where you’re going to be dropped off. Unfortunately, there are no stairs between the ground floor level and the concourse level. There are, of course, escalators! After some sleuthing, I’ve discovered that Flicka and I are going to have to take the parking garage elevators in order to get between the ground floor level and the concourse level. If only the building had built stairs between these two levels; it would make things more efficient for Flicka and me. Flicka went to the Toronto Eaton Centre this afternoon. This shopping mall can be very busy, and it was busy when we were there. This gave me an opportunity to see how Flicka handles crowds. I was impressed with her. Flicka listened to my commands, and performed the way that I wanted her to. Later in the afternoon, we went to a hospital for an appointment. Flicka did well in this environment as well. I was asked by a patient what kind of service dog Flicka is. This interaction gave me an opportunity to practice my rehearsed reply. My first reply to the question of what kind of service dog she is is to say that she’s a Golden Retriever. I appreciate that it could be interpreted that I’ve dodged the question with my reply; however the question is ambiguously and open to more than one interpretation. If the person then asks me what service she provides, I say that Flicka helps me with the management of a medical condition that I have. If the person then asks me what my medical condition is, I politely reply that I’m not comfortable talking about it but that I am comfortable saying that Flicka does a great job helping me. Tonight, I took Flicka to a different off-leash dog park. Similar to my experience on Tuesday night, Flicka thrived in the park, and had a lot of fun. Not only does she work hard, but Flicka also plays hard. Woohooo! This morning, I took Flicka to a large public library to practice with her in public spaces. She did really well. Unfortunately, one patron did not like dogs and acted out in an inappropriate manner. Flicka and I ignored him and kept on our way. We had lunch today with one of Flicka’s trainer, Tamara. Over lunch, Tamara provided me with some more tips on working with Flicka, and we discussed some questions and concerns that I had. After lunch, we took Flicka into a retail mall to get some practice in before my public access test on Friday. Flicka handled herself really well, and Tamara seemed to be impressed at how quickly Flicka and I are responding to each other. This evening, I took Flicka for a 40 minute walk. I had her out of her jacket. She pulled me a bit, wanting to go ahead of me. Today was a busy day for me with Flicka. We took a ride in my vehicle for the first time. Flicka took an instant liking to the bench located at the rear of my vehicle’s cabin. She stretched herself across three seats, and seemed to be content. Loading her into the vehicle was easy. I took off her leash and said “up, up”, and then she hopped into vehicle. Great training, National Service Dogs! During our ride around the city, we stopped at a number of retail stores so we could get Flicka some food and treats. Flicka was a professional, and handled her time in each store well. Inside myself, I felt like “yeah, this is my new awesome dog – look at her go”! One of our stops was Walmart. Unfortunately, Walmart Canada has a poor reputation in the service dog community because there have been quite a few incidents where staff at Walmart stores have given service dog handlers a hard time, and, in some instances, have denied them access to their stores. Some of these encounters have been documented by local and National media in Canada. I know that National Service Dogs has, in the past, written to Walmart Canada to let them know that this unfortunate conduct is taking place on a store level. As soon as I walked into the Walmart store, I was stopped by a staff member and told that my dog was not permitted in the store. Flicka was wearing her jacket which says “National Service Dogs” on each side. I told the staff member that my dog is a certified service dog, and I offered to show him Flicka’s identification. He took me up on my offer, and, after he reviewed her documentation and was satisfied that she was who I said she was, he permitted us to proceed into the store. I’m pleased this issue was quickly resolved. Tonight, I went out for dinner with my partner and some members of her family. We sat on a patio. As soon as I approached the chair I was going to sit in, Flicka darted underneath the chair and then stayed there for the duration of the meal. Woah! Absolutely amazing! Once again, nice training National Service Dogs! After dinner, we took Flicka to an off-leash dog park, and discovered that she loves to retrieve! Hence the name Golden “Retriever”, I guess. Not only did she hunt down her own balls, she also went after the other dogs’ balls. She was, by far, the fastest dog in the park, and I was amazed at how much speed she has. I had no idea that Golden Retrievers can run so fast and can track down objects with such precision. I’m also impressed by her stamina levels. It was as if she had put on a super-charged battery pack and had boundless energy. Flicka’s recall is spectacular. When she was at the opposite end of the dog park from me (say a distance of at least 100 meters), she would return to my feet as soon as I called her name and said “come”. Once she arrived at my feet, she would sit and look at me for her next command. Woah! I have never experienced this with a dog before. I’m stunned and delighted. Flicka has limited tolerance for male dogs who over stay their welcome with her. While at the dog park, when a male dog sniffed around a little too long for her liking, Flicka would, in no uncertain terms, tell them so and the male dog would take off, leaving her alone. Also, while lying on the grass at the off-leash dog park, when a male dog came too close to my friends and I, Flicka would get protective and tell the other dog to back off. We’ve only been together for about 30 hours now, and already, Flicka is protective of me. Incredible! Flicka has arrived at her “forever home”! This afternoon, Flicka arrived at her “forever home”! The phrase “forever home” is used within the service dog community to connote when a service dog has been placed with its end client/user. Flicka and I spent some time with her trainer, Tamara, and Tamara showed me Flicka’s numerous commands. Flicka responds to the following commands: “sit”, “sit stay”, “forward”, “heel”, “come”, “ok”, “in or up”, “watch me”, “leave it”, “down”, “down stay”, “off”, “enough”, “quiet”, “drop it”, “hurry up”, “go to your mat”, “visit”, “hug”, “block”, and “cover”, “back”. I’ve also learned that there is a special command sequence that I’m suppose to use with Flicka. First, I’m suppose to say her name to get her attention. Once I have her attention, I’m then suppose to give her her command. If she doesn’t listen to the command the first time I give it to her, I’m suppose to repeat it. If she’s still unresponsive, I’m then suppose to physically correct her. Once Flicka performs her command, I’m to praise her with either verbal or physical praise or a treat. So far, Flicka has been very responsive to the commands that I’ve been giving her. I struggle with my emotions. My pattern has been to try to bottle them up and suppress them in the hope that they will go away. If you have ever tried this, you will know that it does not work very well. For me, when the emotions surface, they have often been uncontrollable. Tonight, after Flicka’s trainer left, Flicka and I went into my bedroom. With her, I felt safe, and I had a good cry. She stayed with me, was in constant contact, and the crying did not spiral into anything more than a much needed emotional release. Later in the evening, I took Flicka for a short walk, and we rode the public transit bus for a few stops. Flicka handled herself very well. On Tuesday, June 11th, National Service Dogs (NSD) held it’s annual general meeting (AGM). While I was unable to attend, NSD Flicka was there! Click here to watch a very short video that highlights NSD’s achievements in 2012. Click here to watch a very short video featuring Dani Forbes, NSD’s Executive Director, as she shares NSD’s achievements in 2012.